Prestel was the GPO, later British Telecom's, answer to teletext. With two way communications between user and servers, many more pages could be offered, and user interaction could be achieved through response frames to the Information Providers, user to user emails, and public chatlines. Launched in 1979, it quickly spawned a whole industry of publishing companies, hardware and software suppliers, and of course companion and competitor services. Prestel, however, was always the Big Daddy of the services. The service was never as popular as it was envisaged. Although it was taken to heart by the Travel and Financial services industries, the home market was never the success it could have been. Televisions with built in adapters were exorbitantly expensive, and hard to find, and dedicated terminals were only really affordable to businesses. Banking by the FiresideDespite this, Prestel was instrumental in developing many of the technologies we now consider commonplace on the Internet and World Wide Web today. The Bank of Scotland had their HOBS "Home and Office Banking" service whereby you could manage your bank accounts online. Club 403 offered online grocery shopping. British Rail offered access to timetables. Kays had mail order shopping from their catalogues. There were several forums and chatlines where ordinary users could post messages and chat among themselves, and later, Micronet allowed anybody to publish their own pages, for a fairly modest fee. Prestel was also instrumental in providing the first taste of electronic mail that many people would experience. Being able to send simple messages for free to friends and family would seem to be a novelty, but it would soon turn out to be one of the most used features of the service. Many friendships were started and flourished through the interactions made possible via Prestel Mailbox, and Prestel was certainly responsible for more than one marraige, and perhaps the failure of several others. To woo business users, Prestel launched Telex Link, which allowed any prestel subscriber to receive and send telex messages. 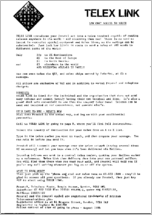 In the days before Fax machines, the telex was the official business-to-business communications medium: Telex messages could be held to be legally binding just like a written letter. 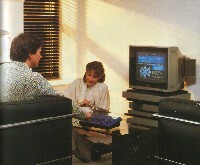 In fact, it was only with the arrival of Micronet 800 in the mid 1980s, started as an online computer magazine by East Midlands Allied Press, and whom for a period gave away free modems for home computers with their subscriptions, that domestic usage began to rise. This was helped by access only being a local telephone call throughout most of the country - a facility otherwise unheard of in the times before "0845" and it's like. Even so, Prestel subscriptions peaked at less than 100,000 subscribers - far below the "millions" of subscribers aimed for when launched. During the daytime, when business usage was high, there was a per-minute charge to use Prestel, but in the evenings and weekends, traditionally the quiet times, it was free apart from the telephone call. Unfortunately, with Micronet being so popular, suddenly the quiet times became fairly busy! Prestel took over Micronet in 1989, and merged it with their other online offerings, forming the BT Dialcom Group. In 1991, Prestel decided to introduce a charge during the previously free times, effectively doubling the cost of accessing the service, and within months managed to kill off the home usage almost completely, confirmed by the closure of Micronet that October. After a decision to concentrate on core network services and not value-added services, the whole lot was sold off to a private consortium, and from there it ended up with Financial Express, where, after a brief appearance as 'New Prestel' it was closed down completely. Despite numerous enquiries, it seems that the hardware and software that was used to run Prestel has all vanished without trace. Financial Express seem to have lost everything, and even the BT Archives have nothing of consequence. All that remains is the relatively few isolated pages that were saved on disc by service users over the years. If you know different, please do get in touch! Please see the Screenshots page to see what you've missed!